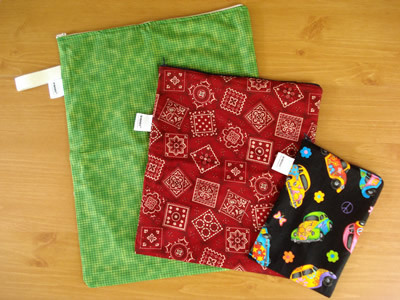 Wahmies Fun Prints Wet Bags are made of a great outer print with an inner layer of waterproof (PUL- polyurethane laminate) fabric so that you can hold your wet diapers without wicking. They are constructed with two layers sewn separately and close with a zipper. Joven carries three sizes: all day, regular and mini. The All Day size measures 16" x 20" and features a webbed handle for ease of carrying. The Regular size measures approximately 13" x 15" and will hold up to 6-8 diapers. The Mini size measures 7" x 9" and are perfect for moistened cloth wipes. Regular and All Day sizes include a 2.5" x 5" pad of hemp french terry or hemp fleece. Put some essential oils or fragrance on them to help keep odors down.